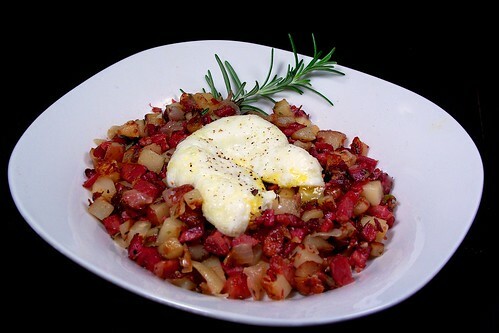 My mom used to make corned beef hash with poached eggs every now and then, always for supper. It was one of my favorite things in the world and to this day it is most definitely comfort food! I’m also fairly certain that she is responsible for my current fondness for breakfast at dinnertime. This past weekend, not long after the corned beef brisket went into the oven and the house began to fill with that familiar aroma, my thoughts were again with her. I daydreamed of those evenings long past when I would rub my hands in anticipation of her wonderful meals. As my sister and I were growing up mom cooked with love and she cooked with flavor and even though it was always with a nod to a tight budget, holy cow was it ever good! It is interesting to me how many of my current favorite dishes, and many that you’ll now see celebrity chefs cooking on TV, have their roots in such simple budget cooking. Was the food of our youth so good because of the long cooking necessary to make the tougher cuts palatable? Are the flavors that developed out of these techniques what makes meat loaves, chicken pot pies, stews and braises so popular even today? Or is it that these foods were prepared with so much love by so many of our moms that it touches our souls even today? The brisket last Sunday was a small one and though I do love leftover corned beef on rye, I squirreled the leftovers away because there was just enough for a batch of my weeknight corned beef hash. This is a simple, peasant style recipe that I can make no claim to as it has been cooked for so long by so many. I only wish my mom lived a little closer so that I could have shared it with her. Notes: It is not necessary to use leftover vegetables. If you do use fresh, pre-cook the potatoes by blanching the cubed potatoes until tender then drain and gently pat them dry. (Remember…the dryer you get them the better because moisture inhibits browning!) Optionally you may also use 1 cup of the leftover cabbage. Be sure to take a look at this Poached Egg video for a really simple way to poach an egg. Warm 2 tablespoons of oil In a large pan over medium high heat. When the oil is shimmering add the garlic, thyme, and black pepper and cook stirring until fragrant, about 30 seconds. Stir in the onions and cook, stirring often, until the onions have just begun to brown. Stir in the potatoes and lower the heat to medium. When potatoes are hot; stir in the corned beef and the rosemary. Cook, stirring or shaking the pan occasionally, until potatoes and beef have browned and formed a desirable crust, about 10 minutes more. Remove the rosemary and discard before serving. Serve topped with a freshly poached egg. This entry was posted in Beef, Breakfast, Entree and tagged Beef, breakfast, Corned, eggs, hash, Onions, poached, recipe, Recipes. Bookmark the permalink.